without the aid of a ​retro-reflector? On August 27, 2008, the Discovery Channel aired a Mythbusters "NASA Moon Landing" Special, in which the crew proceeds to "debunk" claims that prove we never landed on the Moon. During the Mythbusters' Moon Hoax Special, Adam Savage and Jamie Hyneman visited the Apache Point Observatory to fire laser beams at the moon. They started by firing a laser at an unexplored region of the moon, receiving no signal; and then they fired a beam at the Apollo 15 site, receiving a laser back. 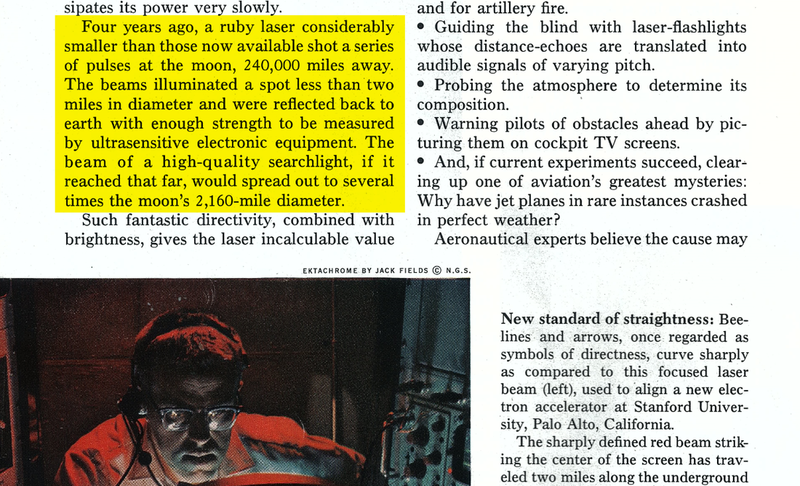 Their conclusion was that if there was no retro-reflector on the moon it would be impossible to bounce the laser back to earth. Jarrah White, of MoonFaker.com, has pointed out that the Mythbusters conclusions were erroneous,. However, some have claimed he took the Mythbusters out of context; citing that the Mythbusters never said that it was impossible to bounce lasers off the moon's bare surface, and that he made that up as a straw man argument. by Allan Weisbecker, at blog.banditobooks.com. off the Moon's surface. ​The article has been republished below. A concentrated beam of light has been bounced off the moon and detected on earth by a Soviet observatory in the Crimea. The feat, reported today by Tass, the Soviet press agency, duplicates an experiment conducted late last year by engineers of the Massachusetts Institute of Technology. The superintensive beam was produced by a laser, a device that amplifies and focuses light. The principle is believed to have potential use in space communications and long-distance energy transmission. 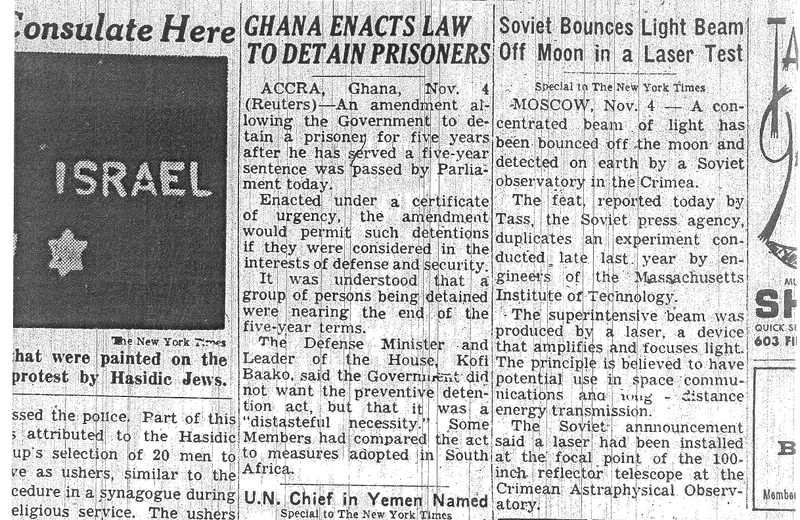 The Soviet announcement said a laser had been installed at the focal point of the 100-inch reflector telescope at the Crimean Astraphysical Observatory. or scientific research, the report covers a wide range of uses for the laser. Four years ago, a ruby laser considerably smaller than those now available shot a series of pulses at the moon, 240,000 miles away. 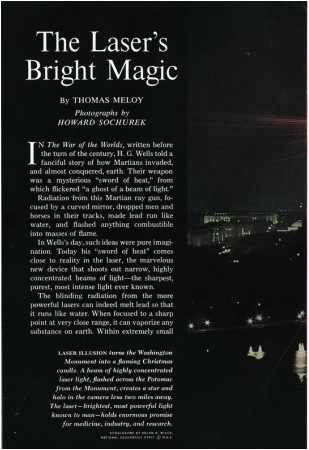 The beams illuminated a spot less than two miles in diameter and were reflected back to earth with enough strength to be measured by ultrasensitive electronic equipment. 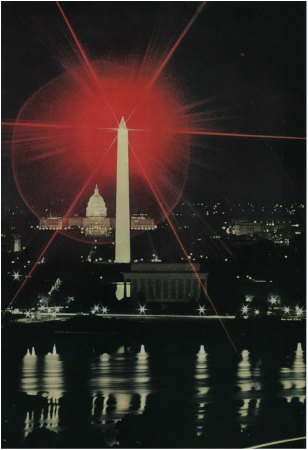 The beam of a high-quality searchlight, if it reached that far, would spread out to several times the moon's 2,160-mile diameter.